A sales scorecard is not the same as a CRM report. CRM reports show lagging metrics: revenue and other outcomes of your daily efforts. A sales scorecard tracks activities as they’re occurring. Activities are leading indicators – the controllable inputs that drive outputs like revenue. Research shows that people who set and regularly update goals are much more likely to achieve them. And tracking sales activities leads to higher performance. A sales report informs reps what they could have done in the past. The sales scorecard enables them to see where they stand against their goals and what they need to achieve them. That’s why modern sales leaders empower their reps with personal scorecards. Here are instructions to build a sales scorecard for your reps and leaders. Your organization tracks a lot of important metrics, but the scorecard only shows what’s relevant for your sales reps. Select four main metrics for the scorecard – three leading indicators and one lagging. Have multiple sales roles? Create a scorecard for each one. A sales development scorecard might include calls, conversations, emails and sales accepted opportunities. But an account executive scorecard would likely have metrics like meetings, demos, proposals sent and closed won. The metrics should be relevant to the sales rep and guide their everyday behavior. By only tracking the most important activities, your reps improve decision-making for where to spend their time. Find more data on selecting sales KPIs here. Reverse engineer your sales process to determine how much of each activity you need to achieve your goals. Start with the amount of revenue you need to bring in this fiscal quarter. Let’s say that number is $10 million, and your average deal size is $1 million. You need to close 10 deals. Assuming your team closes a quarter of the proposals sent out, you’ll need 40 proposals. If you know that every one out of five meetings gets to the proposal stage, you’re going to need 200 meetings. And if every 10 phone calls results in one meeting, then reps should make 2,000 calls this quarter. Consider adding cushion to your goal before setting it in stone. Adding an extra 15-25 percent to your activity numbers can offer an added layer of assurance that you’ll get to your larger goals. Just make sure that the activity numbers are still achievable. Find more detailed instructions for calculating metric goals here. 3. Break down metrics by timeframe. Calculate how much of each activity you need from your team on a daily, weekly and monthly basis. In our table below, we rounded every number with a decimal up to the next whole number and assumed there were 20 working days per month. Some metrics don’t make sense to track on a daily basis because they won’t happen that frequently. 4. Assign to reps and managers. This enables you to keep goals on pace and course-correct performance when metrics fall behind. Activity Completed Total Goal % to Goal On Pace? If you use Salesforce or another CRM system, consider a sales activity management system. Not only does it automatically track your metrics in real time, but data proves that this technology increases activity levels. Review metrics daily. Make the data part of your weekly one-on-one sessions and have sales managers use it to determine where their team members need coaching. 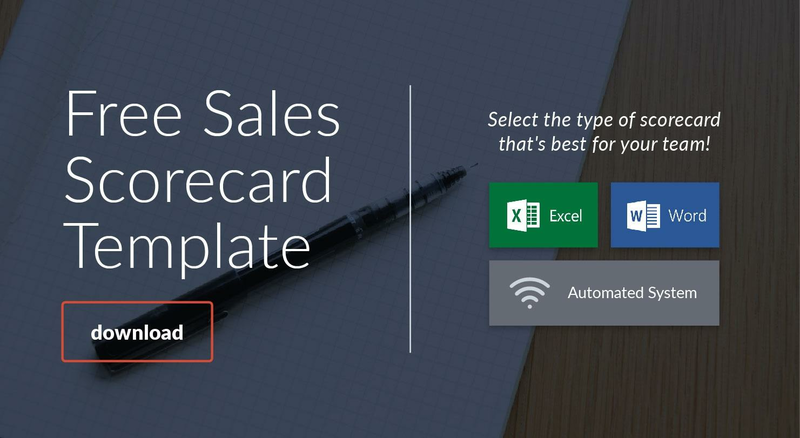 These sales scorecards not only make your metrics highly visible. They drive more revenue through a metrics-driven sales approach. Click here to download the Sales Scorecard Template! A sales scorecard enables reps to see where they stand against their goals and what they need to achieve them. Use these steps to create them for your team.